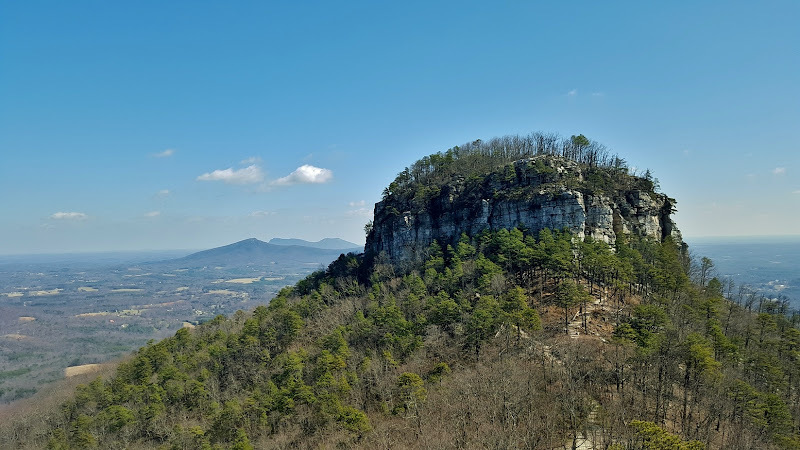 Late Winter Pilot Mountain Hike - Take a Hike! Saturday, I headed to Pilot Mountain State Park for a nice late-winter hike. It was the first time this year I had the opportunity to hike outside of the Raleigh area. We met in the Chapel Hill area at 8 and carpooled out to Pilot Mountain, parking at the Corridor Trailhead parking along Pinnacle Hotel Road. We arrived a little after 930. Once everyone used the restrooms and got their stuff together, we started off on the trail around 10. Hiking across Pinnacle Hotel Road, we started on the red-blazed Mountain Trail. At the first intersection, we turned left to hike around the mountain. This was my first time hiking Pilot Mountain in the winter, though it didn’t feel much like winter. The temperatures were in the 60s and it was unseasonably warm. But the lack of leaves made for lovely winter views. It had also been a while since I had hiked at Pilot Mountain. The last time I was here, several years ago, the Mountain Trail was different. Back then, it led from the Corridor Trailhead parking to Ledge Springs Trail. Now, the Mountain Trail wrapped further around the mountain, intersecting with Grindstone Trail, a half-mile or so below the split with Ledge Springs Trail. Additionally, another part of the loop leads from the Visitor Center at the end of Grindstone Trail back around to the Corridor Trailhead parking lot. Hiking up the flank on Mountain Trail, we could see the distinctive monadnock peak high above. There were also great views of the surrounding countryside. 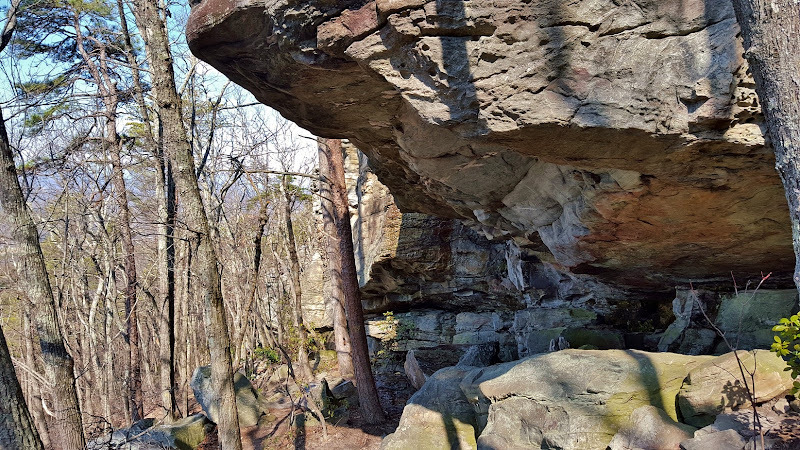 In about 2 miles, we came to the rocky portion of the trail, below the cliffs of Ledge Springs Trail. In the past, the Mountain Trail had terminated near here, but not it went another mile or so to end at Grindstone Trail. When we made it to the end, we turned right on Grindstone Trail to head up to the summit. Most people in the group continued on Grindstone Trail, but John and I took the more scenic Ledge Springs Trail. Hiking below the massive cliffs and climbing over large rocks and stairs, I think this is the best trail in the park. We saw a handful of rock climbers scaling the rocky cliffs and soon made it to Jomeokee Trail at the saddle between the Big and Little Pinnacle. We turned right on Jomeokee Trail and once over to the Big Pinnacle, we found a nice rock outcrop to sit and eat lunch. Across the saddle, we could see the Little Pinnacle Overlook with people enjoying the view. After lunch, we made a quick loop around the Big Pinnacle. There are great views of the surrounding Piedmont landscape. The massive cliffs that make up the Big Pinnacle are quite impressive close up. From a distance, you don’t get a good idea of how big they are. We could see, but not hear, a raptor roosting high above. I also found a really cool tree growing out of the side of the cliffs. Once we finished the loop, we started heading back. We made a quick stop at Little Pinnacle Overlook for great views of the Big Pinnacle and the Sauratown Mountains in the background. Then we headed to the summit parking lot to take the Grindstone Trail back down. I stopped for one more picture from an overlook, then we started hiking down. We followed Grindstone Trail all the way back down to the visitor center, briefly got on the Grassy Ridge Trail and then picked up the Mountain Trail back to our cars. Total distance was about 10.5 miles. The weather had been so nice, it was great to feel like spring was finally on its way.